Maybe Christmas he thought, doesn’t come from a store. Maybe Christmas, perhaps, means a little bit more. A few weeks ago, I was invited to preview the Dealz Christmas collection. Now I know what you’re all thinking – Christmas in October, really? However, as the saying goes; fail to prepare, prepare to fail. Now, I didn’t know much about Dealz before I attended the event other than the fact that everything costs €1.49 and that my mother absolutely loves the store. Therefore, I was pleasantly surprised to discover an array of bargain buys – sure, I could fill a basket for under €20. What’s not to like? Whether you’re looking for decorations or stocking fillers, check out these Christmas steals! Every single Christmas Eve, I find myself running around the house in a panic, searching for gift bags. Usually, after all the shops have shut. Dealz have some really cute options such as the duo pictured above. 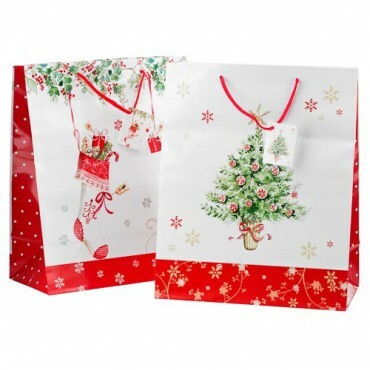 Two gift bags for €1.49? Sure, that’s practically making money. If you have lots of visitors in your home over the Christmas season, your dishwasher will be in over-drive. Dealz have lots of home-ware options so why not stock up on some extras? 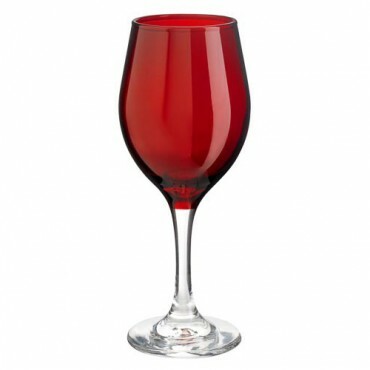 These festive wine glasses are my personal favourite. Red is my self-declared power colour so I think I will be using them all year around. If you have children in your home, you need to run to your nearest Dealz store and purchase as many of these sacks as you possibly can. 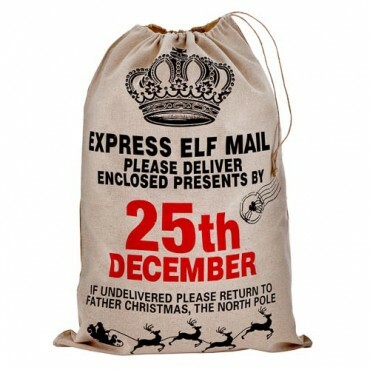 My inner child is squealing with delight at the notion of personalised sacks, straight from Santa’s workshop. Festive candles are a must in my household, and my mother’s scent of choice has always been cinnamon. 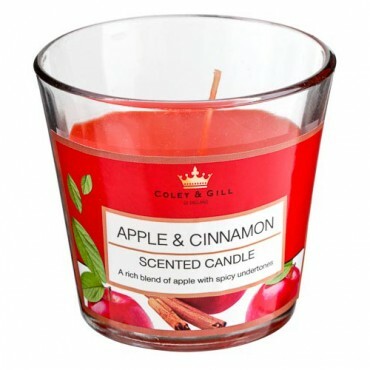 Now, usually we purchase a few luxury candles, ranging in price from €15 to €40 but after smelling the candles which were burning in the Dealz Christmas showroom, I will be saving my money for other treats instead. 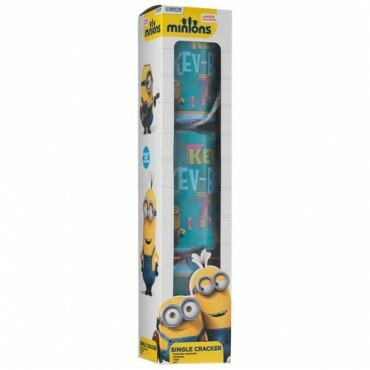 Available in a few different scents, these candles are really fragrant and long-lasting – SOLD! If you’re on a bit of a tight budget for Christmas, a great option is to purchase some affordable accessories in high street stores, remove them from their plastic packaging, and deposit them into swish jewellery boxes. Nobody need ever know that their gorgeous necklace came from the sale section in Penneys. 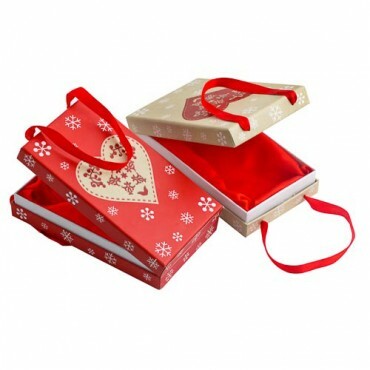 This two pack of jewellery boxes is available in stores nationwide for €1.49. The reality is that Christmas is all about the kids and at the moment, almost every child in Ireland seems to be obsessed with Frozen. 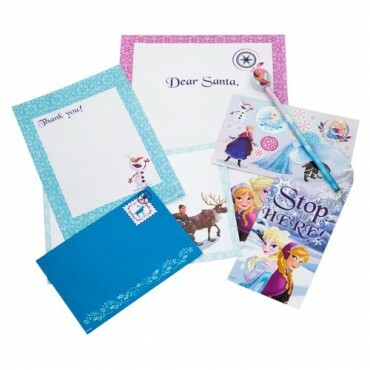 I know a particular baby brother who would be delighted with this Frozen stationary set for writing his letter to Santa. Alright, I know I said “kids” but you’re never too old for Disney, right? 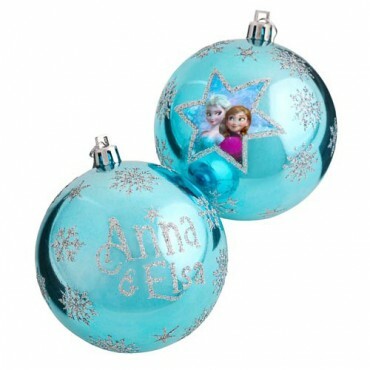 Could I please have these baubles for my Christmas tree? I thought that these individually packaged Christmas crackers would make fabulous stocking fillers. And, it isn’t Christmas without an advent calender. I have very fond childhood memories of scoffing all 24 chocolates in one go, only to mourn the loss for the remaining 23 days so maybe it is wise to purchase a few back-ups for any greedy chocolate monsters. 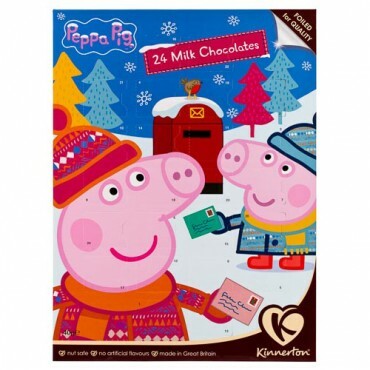 And, if that wasn’t enough chocolate for you, Dealz have a huge range of Christmas sweet sets. 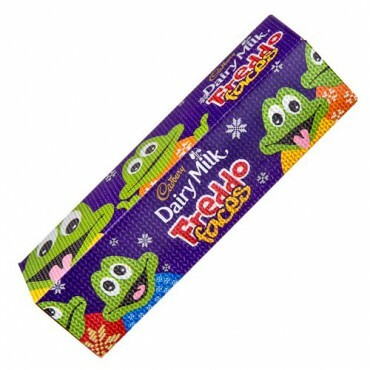 Smarties, Freddos, Malteasers – calories don’t count at Christmas! Everything pictured in this post goes on sale in Dealz in November for €1.49. Will you be stocking up on any of the goodies? You Are The Gin To My Tonic. It’s that time of the year when all we want in our lives is to dip our toes in to the sand with a cocktail in hand. However, some of us have no choice but to slave away at work all summer, chained to the office keyboard. Located just behind Jervis Shopping Centre, KOH bar and restaurant is a gem. With a Thai theme, the vibe is relaxed and exotic. The food looked great, but we didn’t have a chance to try it. 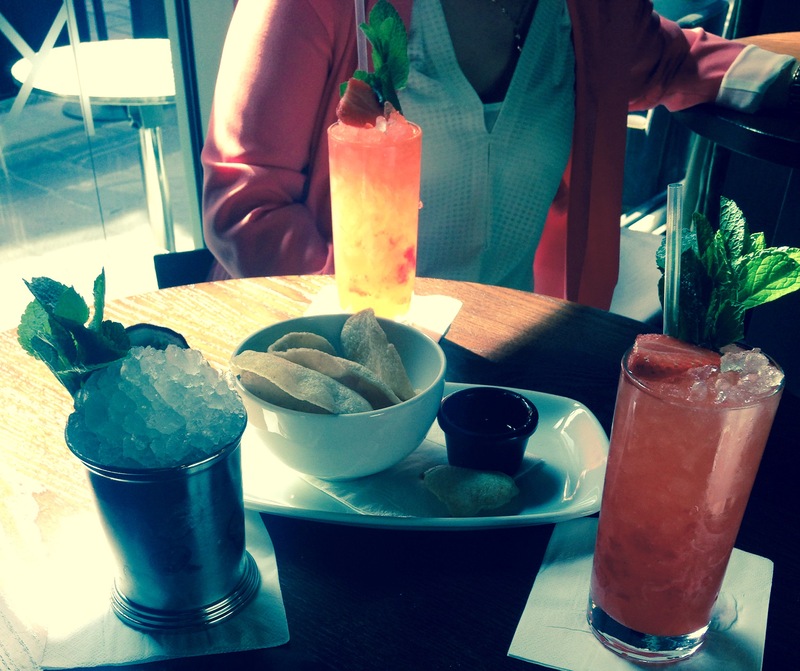 Today, it was all about the cocktails. Toblerone: This offering was created using Baileys Irish Cream, honey, frangelico and cream. It was smooth and velvety, with a taste reminiscent of chocolate milkshakes. This was a firm favourite of the group. Daiquiri: Made using Angostura Reserva, lime juice and sugar syrup. Daiquiri cocktails seem to be hugely popular in Ireland and while this one was delicious, I recommend trying something new when you have expert mixologists waiting to tickle your taste buds. Cherry Bomb: This one was a mixture of Cherry Heering, cognac, cherries, sage and lime. A feast to the taste buds, I really enjoyed this choice. It offered a really authentic cherry flavour while providing a strong kick. Start Me Up: Credited as one of KOH’s own creations, this cocktail is made up of gin, elderflower liqueur, passion fruit and mint. This cocktail was a burst of flavour, full of minty fruitiness. Highly recommended. So, I’ve found my new favourite cocktail spot in Dublin. At approximately €9.50 per cocktail, KOH is certainly a treat but a worthwhile one. Keep an eye out for special offers on their social media outlets. 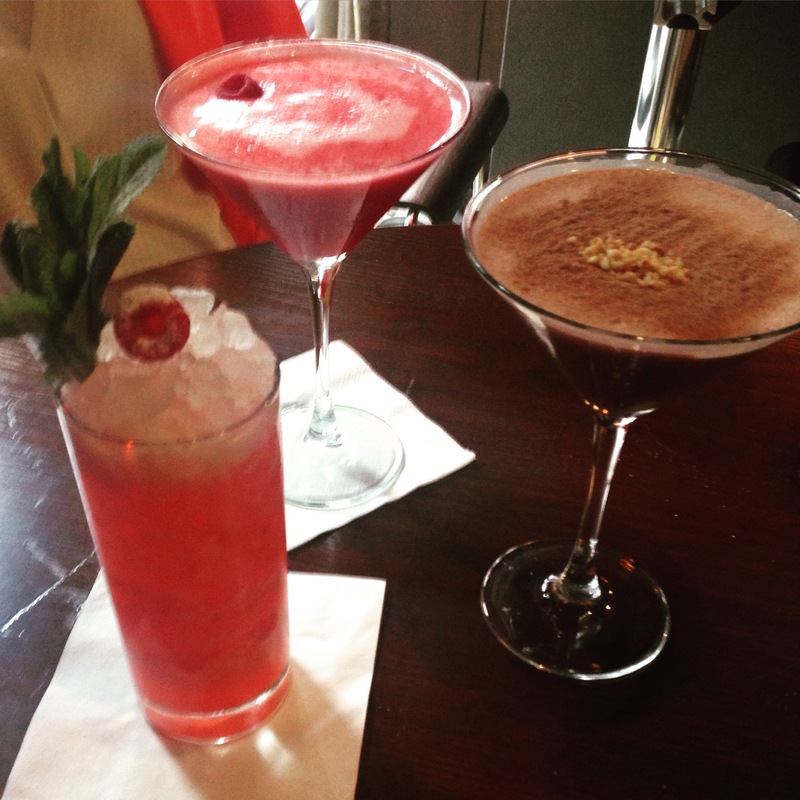 Have you got a favourite cocktail spot in the city? Let me know!